If drugs were legal, Pablo Escobar would be a typical outlier. 20 years of his death. There is a celebrated trend of writing good things about successful people. Due to the innovation of Apple products and its success, Steve Jobs may represent currently the maximum expression of both entrepreneurial leadership and personal biography writings. Values and social opportunities come jointly to place in order to make sense of personal successes. For those of us who live the 21st century, it is more than clear that Modern societies like to celebrate success so that futures generation may build upon such experiences and stories. However, little attention is given to success of those who we condemn. Success in criminal careers also deserves analysis and reproduction of stories in books and documentaries so that they shall not be replicated by new generations. Certainly, Steve Jobs’ experience may shed light onto what needs to be done to achieve technological and economic success, but Pablo Escobar may also shed light onto what is necessary to do in order to avoid violence and delinquency. Pablo Escobar may be considered an outlier from a series of drug smugglers and criminals that had the perfect setting for criminal and economic success. It is hard to categorize trafficking, assassinations, racketeering, bombing, money laundry and smuggling as successful activities, but Pablo Escobar was certainly an extraordinary person in such set of endeavors. The first aspect that determined Pablo Escobar’s criminal career was having a moral double standard. As a person, Escobar had big ambitions as well as Steve Job may have had. Escobar was as poor as Bill Gates may have been. Compared to famous entrepreneurs, there was probably nothing different in Escobar’s mind that made him a risk-taker type of person. The difference may reside on the social environment Escobar grew up in and the set of values he was surrounded by. The mindset that was instilled in Escobar was deeply mediated by the cultural setting of Colombia during the 50’s. That decade represents a breakthrough moment for Colombian culture. Since its early years as a Republic, Colombia had strong civil control over people based on religious values. The Republic and the society lived in under a strong agreement sealed by the Catholic Church. Colombia inherited from Spain a deep devotion for Catholicism and Catholic Institutions. Since colonial times, the Catholic Church represented the higher authority in many of the little towns of Colombia. Furthermore, since roughly 1886 the Republic and the Church shared civic, moral and social control over the population. The separation of Church and State took place in Colombia just until the late30’s. Pablo Escobar was born in 1949 and grew up in such new cultural setting. Pervious to Escobar’s birthday, public schools were administered by the Catholic Church. Honestly, religious-oriented administration worked out well for years in Colombia by instilling moral values into the population and at the same time overseeing young’s people behavior. Somehow, the Church’s moral system helped keep standards that most of the people agreed on. For Pablo Escobar the story was different. For the first time in Colombia’s history during the 40’s and 50’s, the education would be administered by the public sector. Indeed, Escobar’s mother was precisely a teacher at that time with the revolutionary ideals about religious social control. Secularism took place of both Escobar’s education and Escobar’s home. Although related, it is unfair to blame parental relationships for adult criminal behavior. What is indeed true is that the Republic at that time had neither means nor experience in dealing with social services like education. Thus, the lack of experience in education policies meant for Colombian young people in the 50’s a significant decrease of education quality. 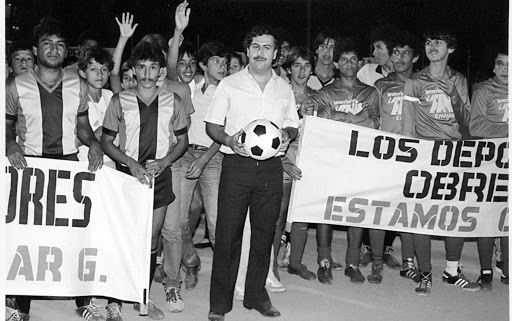 Escobar’s generation was the first in being exposed to the new national education policies. As it is naturally expected, after a long marriage between the Republic and the Church, the State during the 40’s and 50’s wanted deliberatively to take distance from the old methods of learning and teaching that were established by the Catholic Church. That included obviously a shift on moral issues. In almost the same way Protestantism shift away from the religious principles established in Europe during the Renaissance, Colombia did so during the 40’s. However, what Colombia missed was the spiritual leadership of Martin Lutero, Jan Hus and Jean Calvino. What remained in Colombia after the Church left the education system was chaos and freedom to believe without any sort of spiritual or civic orientation. That was Escobar’s choice. Escobar was barely taught of difference between good and bad. His moral standard was up to him. For him, there was neither authority nor raw models to follow. Therefore, Escobar’s moral standard shaped his ambitions and stirred his life into a criminal success. With no moral principles, it is very likely that Escobar wanted to be successful as much as Alphonse Gabriel Capone probably did. For some reason both of them share similar experiences with the Catholic Church. Both families “abandoned” somehow the creed and its moral standards. Once they grew up in such lack of faith and civil roots, both Escobar and Capone, faced similar opportunities for criminal careers. The window that opened to Escobar’s criminal enterprise was the lack of state control of delinquency. The Police organization that patrolled Colombia during the 70’s was not professional; it was concerned of political matters rather than crime. During the 70’s Colombia’s economic priorities were established around coffee crops that were to be exported to United States. Exports to the United States were the opportunity that a new entrepreneur without moral standards gazed in the horizon. Escobar understood the economic profits of exports and the chance to do so without any type of judicial risk. There was not state police that may deter him from doing business. Likewise, there was a big market eager to make life more “exiting’. The market that allured Escobar’s ingenuity was shaped by an American generation that wanted to be free from many social pressures. The Music Festival of Woodstock in 1969 and the use of the birth Control Pills are just two examples of a gateway leading toward uncontrolled social behavior. Escobar understood better than anyone else the demand for drugs in the United States, and also understood the advantage of producing cocaine in the isolated country side of Colombia. Pablo Escobar could have been better known for other kind of business. Let pretend for a moment that we do not know what kind of business he managed. Furthermore, pretend drugs are legally accepted around the world. Then everybody will have to admit that Pablo Escobar was an extraordinary merchant who knew how to lower the cost of shipping products toward American shores. Escobar was the kind of person who better understood American taste and demand. The industrialization of the product was also refined by his ingenuity. The quality of the product was raised to the top. Processes of production, logistical chains were brilliantly organized. Management of personnel went up to the extent of feudal loyalty, and made the Cartel de Medellin an extraordinary organization for doing businesses. The profits derived from its activities gave the Cartel de Medellin worldwide recognition. A brand was created and administered as one of the most regarded brands in the world. There was only one thing that never fitted either in the rest of the society and in history: legality of drugs. Otherwise, this story would be one of an authentic outlier. “The People’s Money. How voters will balance the budget and eliminate federal debt"
Paradox of Leadership: William Lantigua and Vincent A. Cianci.